When I met Sabrina, I knew she’d have a peaceful home birth in Jackson Michigan. She was living with her parents while she neared the end of her pregnancy so that she could be near the birth team she loved and trusted. 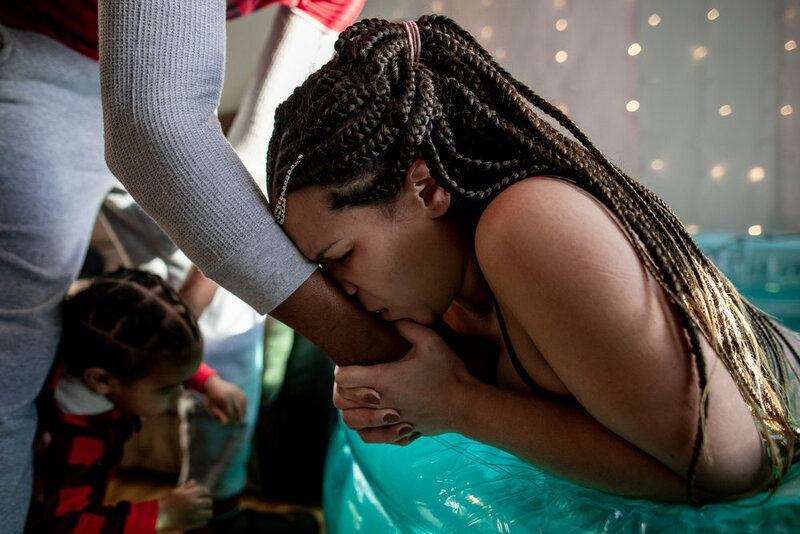 I love that she chose her team for her peaceful home birth so carefully and I’m grateful that she chose me as her birth photographer and doula. When we arrived, she was in active labor, but still smiling and talking between contractions. Its incredible to watch physiologic childbirth unfold. She ate spaghetti made by her loving mother, drank water and chomped on ice, napped with her son, breastfed her baby, got in and out of the water, and did it all under the watchful care of her midwife Hannah Simmons. It truly was a peaceful labor and birth on one of the coldest days of the year. Sabrina got out of the tub and onto the bed to deliver her baby, even though she had hoped to be in the water, this was where her body needed to go. She pushed her baby out with such strength and beauty, that it amazed all of us. After her peaceful home birth in Jackson, she got back into the tub for a postpartum herbal bath. Her beautiful daughter fell asleep in her arms and they spent a blissful few hours together before falling asleep for the night as a family of five. Take a minute to check out this gorgeous birth story and if you are interested in birth photography, please reach out today and we can set up your free consult! Laboring at home in the water - so peaceful.